In terms of invasion biology, vascular plants are the most intensively researched taxonomic group; at least 395 plant invaders have been addressed in detailed case studies globally, accounting for 44% of all invasive taxa studied; after North America, Europe is the continent enjoying the most intensive study with at least 80 invasive plant species having been addressed (Pyŝek et al. 2008). However, although there is a considerable body of information on major plant invaders in Europe (see also Weber 2003), the situation is much less satisfactory as far as complete national inventories of alien plants are concerned. Prior to the DAISIE project (www.europe-aliens.org), only few countries had a sound information on the composition of their alien floras, available in specialised checklists, notably Austria (Essl and Rabitsch 2002), the Czech Republic (Pyek et al. 2002), Germany (Klotz et al. 2002; Kühn and Klotz 2003), Ireland (Reynolds 2002) and the UK (Clement and Foster 1994; Preston et al. 2002, 2004). This situation directly translated into poor knowledge across the European continent. 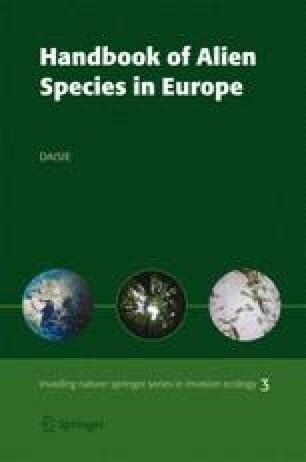 The only available continental analysis of plant invasion patterns in Europe (Weber 1997) was based on data from Flora Europaea (Tutin et al. 1964–1980), the only synthetic source of information on floras of particular countries, including alien species. This source is, however, nowadays outdated and contains numerous inaccuracies in data for individual countries (Pyŝek 2003). In general, information on the presence and distribution of alien plant species for most European countries was scattered in a variety of published and unpublished accounts and databases; this is the case in other continents too (Meyerson and Mooney 2007). On the plant side, DAISIE was thus a major challenge of collating and assessing existing data on the most numerous group of European aliens and concentrating this information in an authoritative continental inventory.